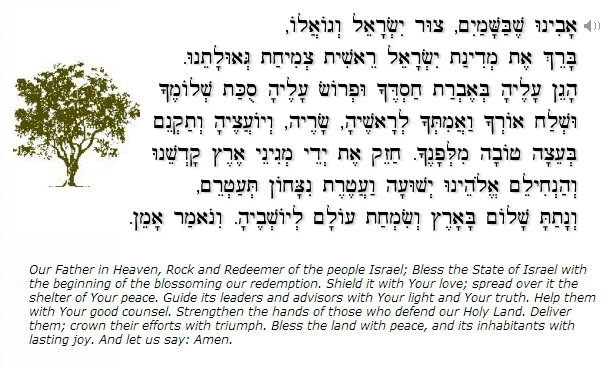 Avinu Sh’b’Shemayim – Heavenly Father, Israel’s Rock and Redeemer, bless the State of Israel, the first flowering of Your final redemption. Shield it under the wings of Your loving-kindness and spread over it the Tabernacle of Your Peace. Send Your light and truth to its leaders. ministers and counselors, and direct them with good counsel before You. Strengthen the hands of the defenders of our Holy Land; grant them deliverance our God, and crown them with the crown of victory. Grant peace in the Land and everlasting joy to its inhabitants. Even if you are scattered to the furthermost lands under the heavens, from there the Lord Your God will gather you and take you back. The Lord your God will bring you to the Land your ancestors possessed and you will possess it; and He will make you more prosperous and numerous than your ancestors. Then the Lord our God will open up your heart and the hearts of your descendants, to love the Lord your God with all your heart and with all your soul, that you may live. Unite our hearts to love and revere Your Name and observe all the words of Your Torah, and swiftly send us Your righteous Anointed One of the house of David, to redeem those who long for Your salvation. Avinu Sh’b’Shemayim! 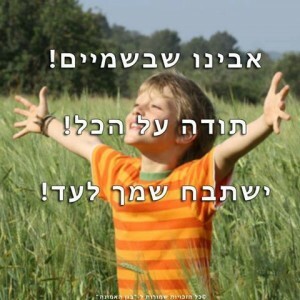 Todah al ha’kol! Yishtebach Shimcha le’ad! Our Father in Heaven! Thank You for everything! I will bless Your Name forever! When we pray; God our Father, to Whom we pray, first sees our hearts and then, in addition, hears our words. “The Lord brings the counsel of the nations to nothing; He makes the plans of the people to no effect. The counsel of the Lord stands forever, the plans of His heart to all generations” (Psalm 33:10-11). Recorded prayers, written in accord with Scripture and with the sincere intent to honor God, are valuable tools and aids to prayer and together with individual, personal prayer will rise like incense to the Throne of God. Our Father, bless the State of Israel which is the beginning of the blossoming of Your great and final Redemption for Israel and for all the earth. The Romemu Prayer – from the Koren Siddur, pg 68 – is a selection from the Book of Psalms on the theme of hope and trust in God. It forms a moving transition from then to now, from the days of King David to today and affirms the ongoing and eternal Covenant with Israel. Exalt the Lord our God and bow before His footstool. He is holy. Exalt the Lord our God and bow at His holy mountain; for holy is the Lord our God. He is compassionate. He forgives iniquity and does not destroy. Repeatedly He suppresses His anger, not rousing His full wrath. You, Lord, do not withold Your compassion – rachamim – from me. May Your loving-kindess and truth – chessed ve’emet – always guard me. Remember, Lord, your acts of compassion and love, for they have existed forever. Ascribe power to God, whose majesty is over Israel and whose might is in the skies. You are awesome God in Your holy places. 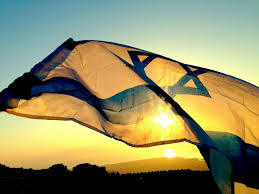 It is the God of Israel who gives might and strength to the people, may God be blessed. God of retribution, Lord, God of retribution appear! Arise, Judge of the earth, to repay the arrogant their just desserts. Salvation belongs to the Lord, may Your blessing rest upon Your people. Selah! The Lord of hosts is with us; the God of Jacob is our stronghold. Selah! Lord of hosts, happy is the one who trusts in You. Lord, save! May the King answer us on the day we call. Save Your people and bless Your heritage; tend them and carry them forever. Our soul longs for the Lord; He is our Help and Shield. For in Him our hearts rejoice, for in His holy Name we have trusted. May Your loving-kindness, Lord, be upon us, as we have put our hope in You. Show us, Lord, Your loving-kindness and redeem us for the sake of Your love. “I am the Lord your God who brought you up from the land of Egypt: open your mouth wide and I will fill it.” Happy are the people for whom this is so; happy is the people whose God is the Lord. I have been going over all the Psalms of Ascent and just found this prayer. 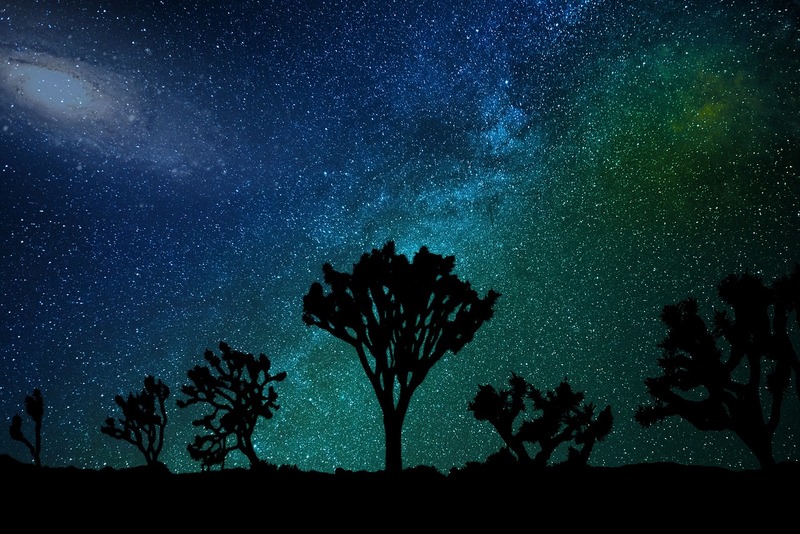 It is beautiful, I tried to enlarge it so I could read it better but I do not know how. Thank you for all the wonderful work you do to make this a place we can go and receive. Thank you and may the Lord bless you from Zion, Rena. Please remember to pray for the peace of Jerusalem – and all Israel. The Shalom of all the nations depends on the Shalom of Israel. Give Him no rest, who hears and honors our heartfelt prayers!